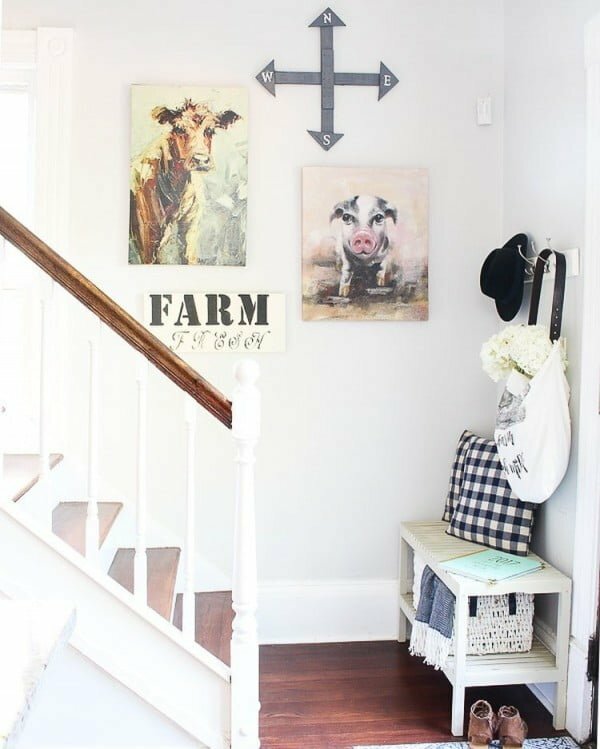 Looking to update your entryway with a new farmhouse look? 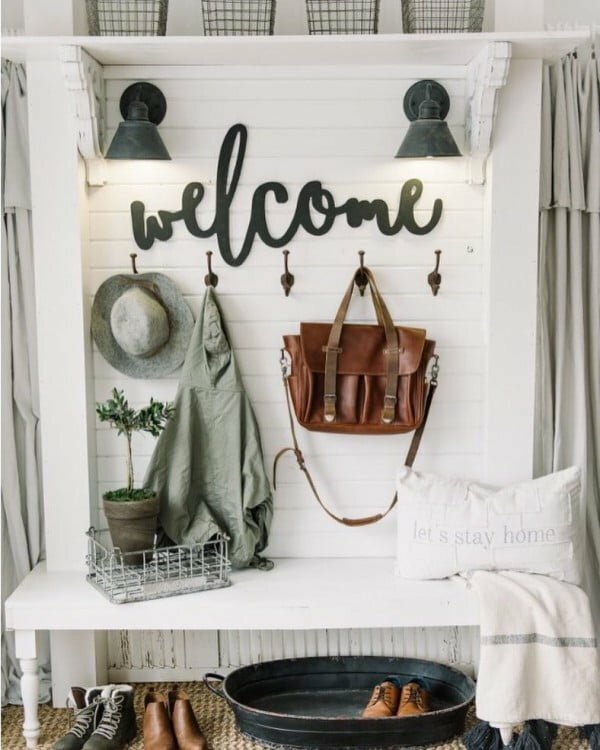 Check these 20 most welcoming and charming entryway ideas for your inspiration. The entryway is an in-between space that creates a bridge between the exterior and the interior of the home. 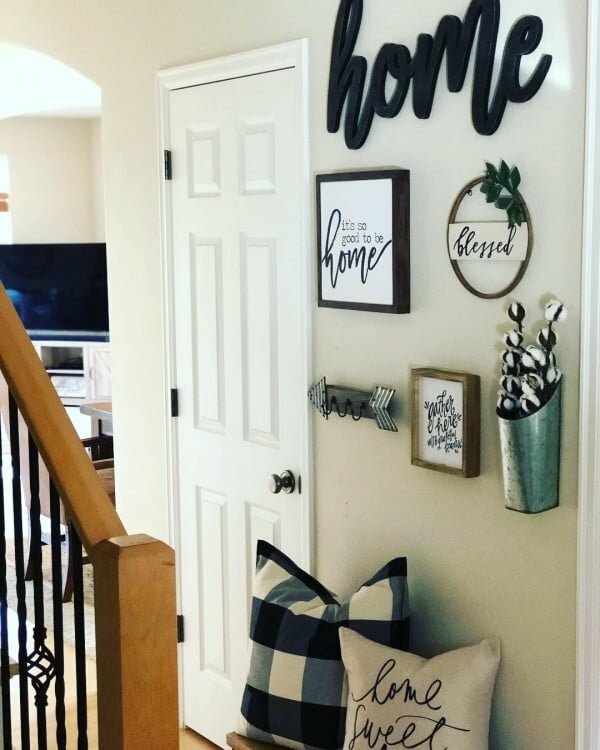 The entryway is the first space seen by your guests as they walk into your house and the last area they encounter before leaving. It serves as the perfect space in which to add a few personal flourishes. 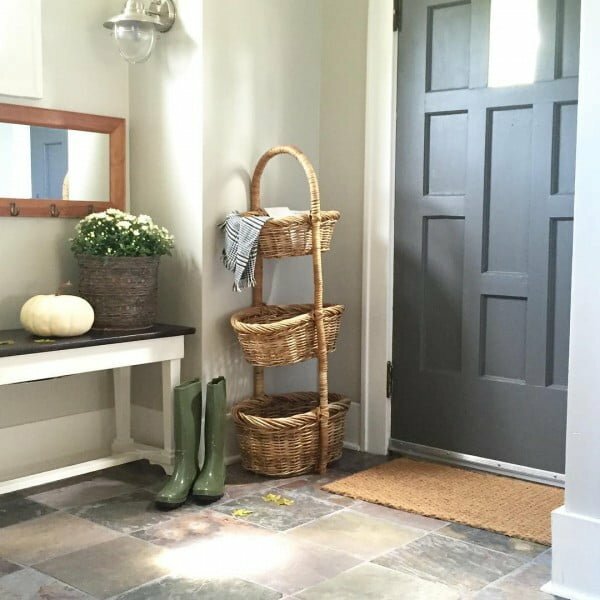 If you prefer farmhouse decor and want to reflect that in your home, an entryway is a remarkable place for you to showcase this. 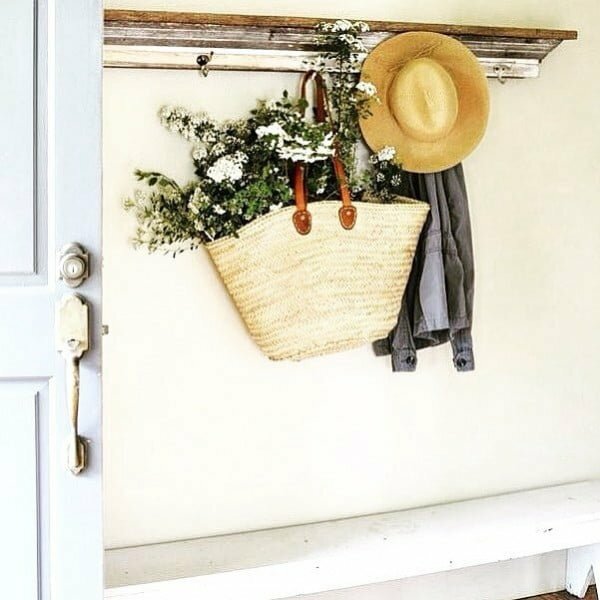 A farmhouse entryway allows you to add adorable decorations and accessories. These include floral pieces, throw pillows and lace or worn textiles. Additionally, wallpaper and textiles can add extraordinary elegance. 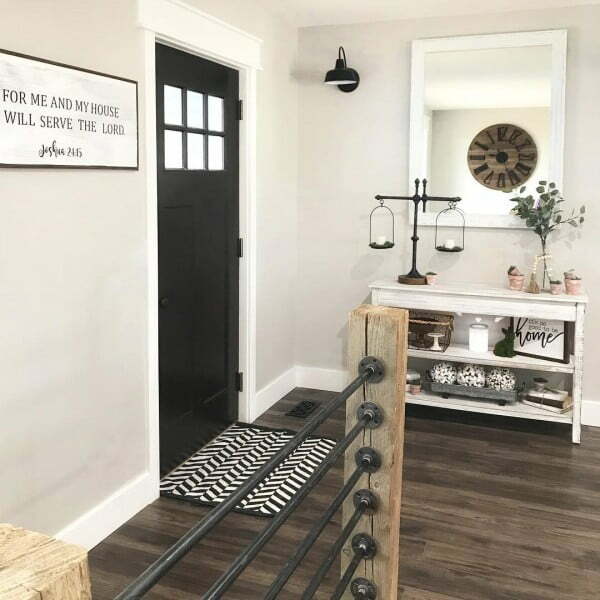 If you would like your guests to be filled with anticipation for what is on the inside of your home before the door even swings open, you can explore the farmhouse entryway decor ideas that are outlined below. 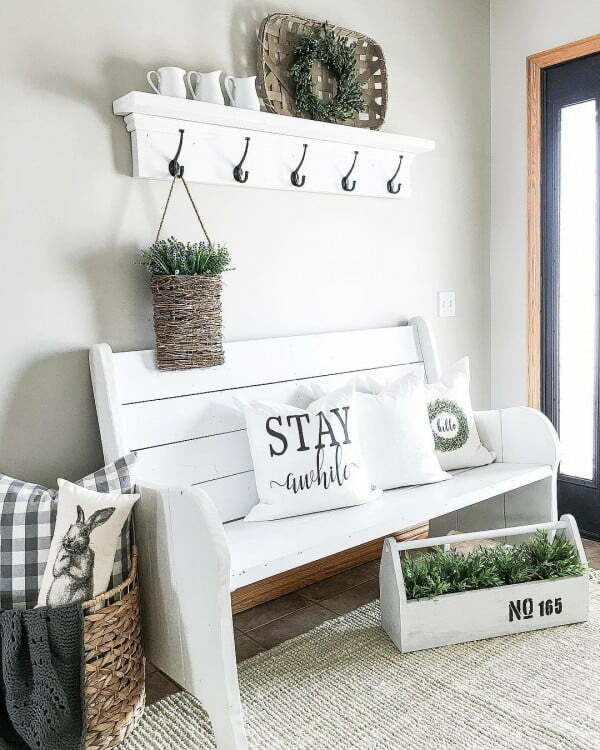 This re-purposed white pew sets the perfect tone for welcoming guests into your home. The inviting cushions and other well-placed accessories make for a gorgeous entryway. 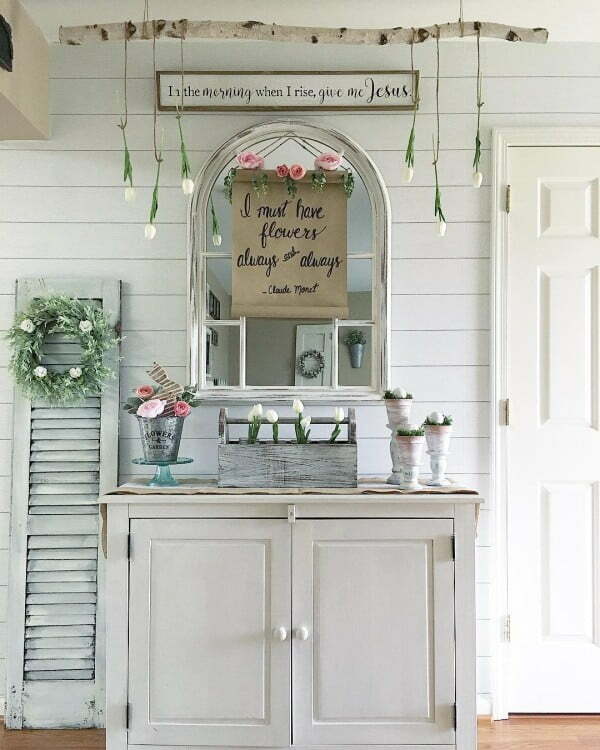 This mainly monochromatic entryway décor reflects the sweetness of spring. The inclusion of the floral elements and the wreath-adorned white shutter makes the space warm and inviting. 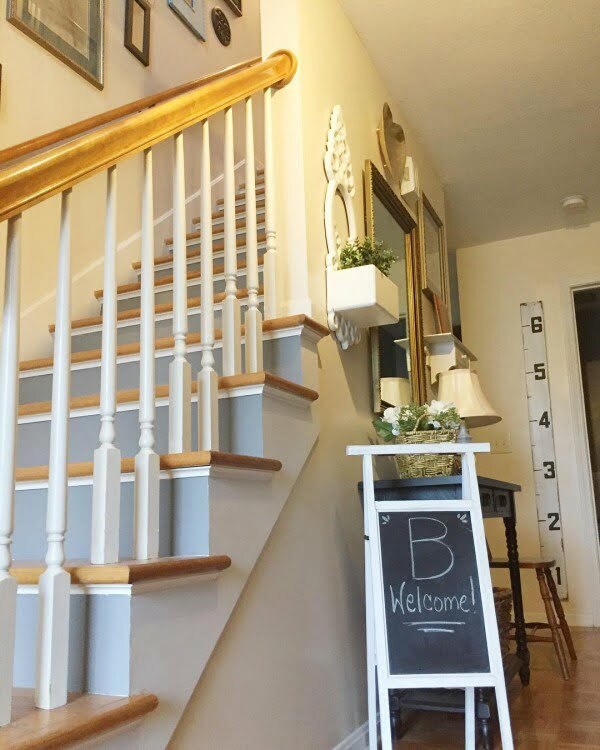 A handmade welcome sign, a beautiful basket of flowers and a small coordinating rug are all this entryway needed to stand out and be sensational. 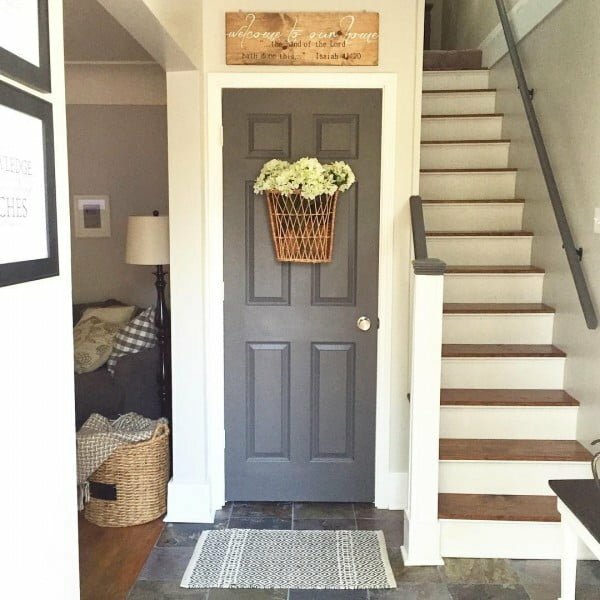 This practical entryway has a terrific three-tiered basket as part of its design. This seems like the ideal storage space for items like keys, mail, and scarves. 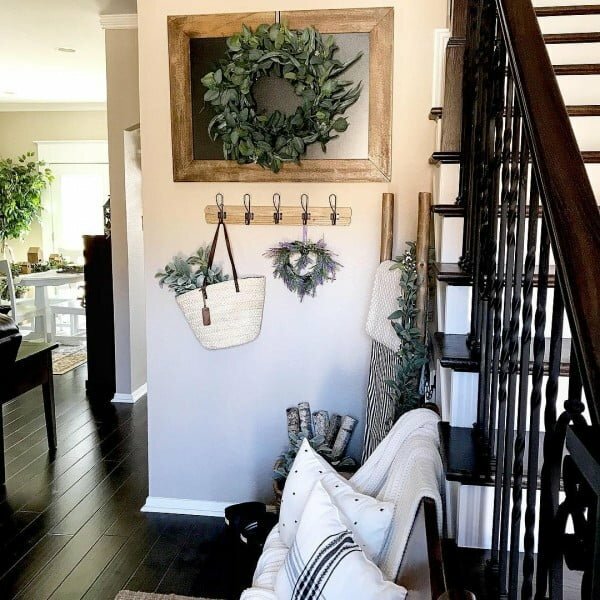 This quaint entryway uniquely features a French shopping bag filled with beautiful flowers and hung on a piece of shabby chic molding. This pristinely designed entryway features a beautiful white open-back frame. 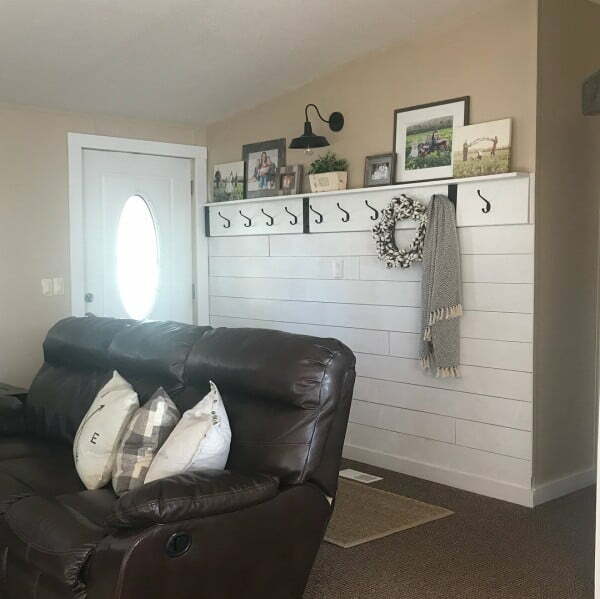 It has been painted, and white-washed shiplap has been added to it for a more rustic feel. This elegant entryway provides a tasty treat for the eyes. It is the perfect place to greet you every time you enter and welcome guests into your home. 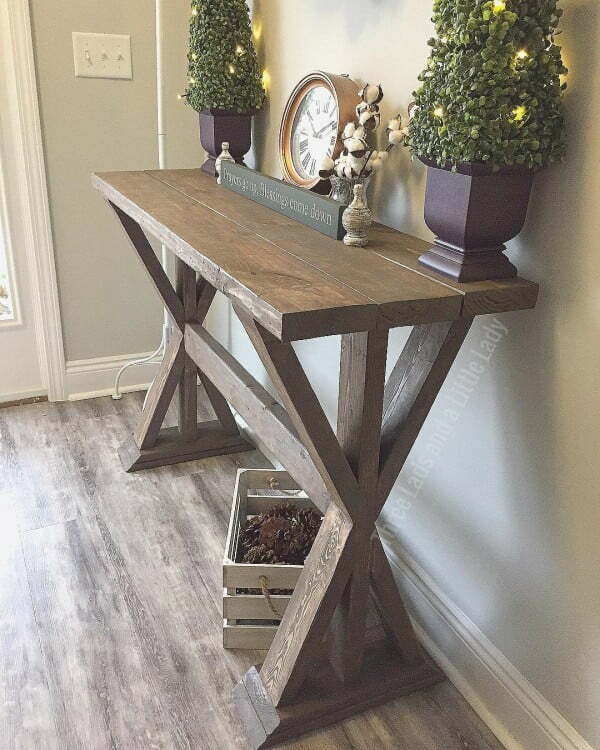 This handmade console table in natural pine wood sets the tone for a clean yet fantastic farmhouse entryway. The awesome accessories add much interest to space. This “farm fresh” space includes paintings of farm animals and a white bench with storage baskets underneath. The cushions and other accessories perfectly tie the area together. 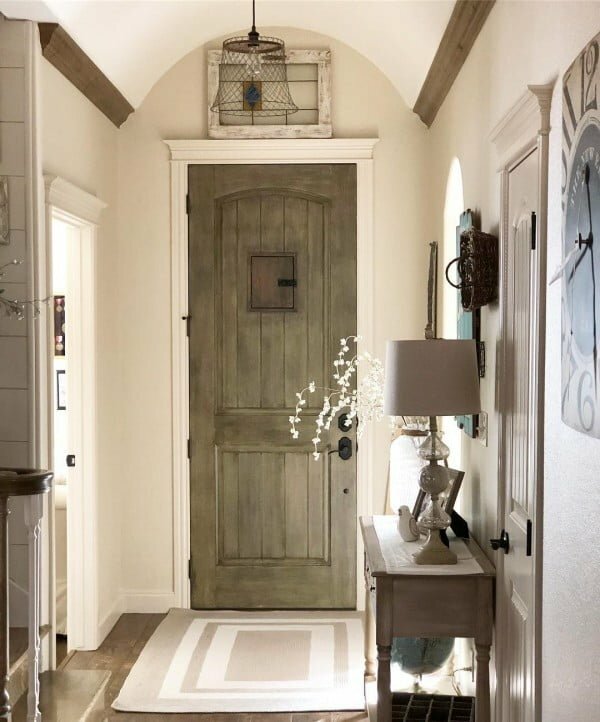 The barn doors in this entryway are all that is needed to create interest. They add depth to this mostly white space and coordinate with the other wooden elements. This black and white work of art is beautifully styled in a theme that exudes faith and inspiration. The white shutters provide the perfect spot for the hanging greenery. 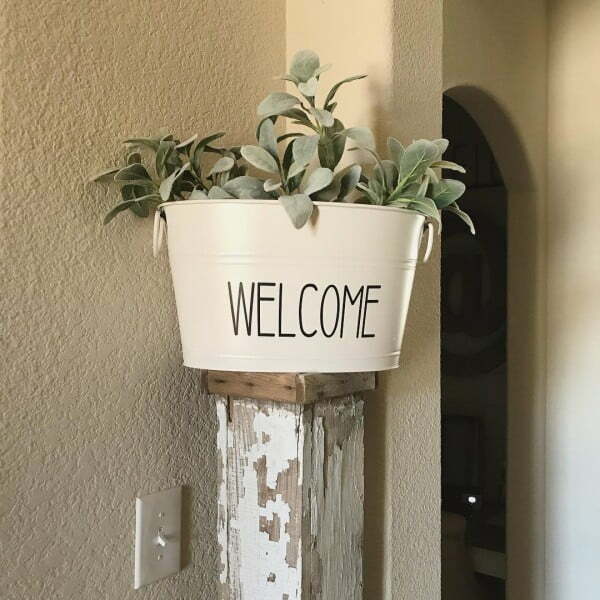 This painted galvanized wash tub has been transformed into the perfect planter. Its elevated position in the space creates the ideal focal point for this entryway. 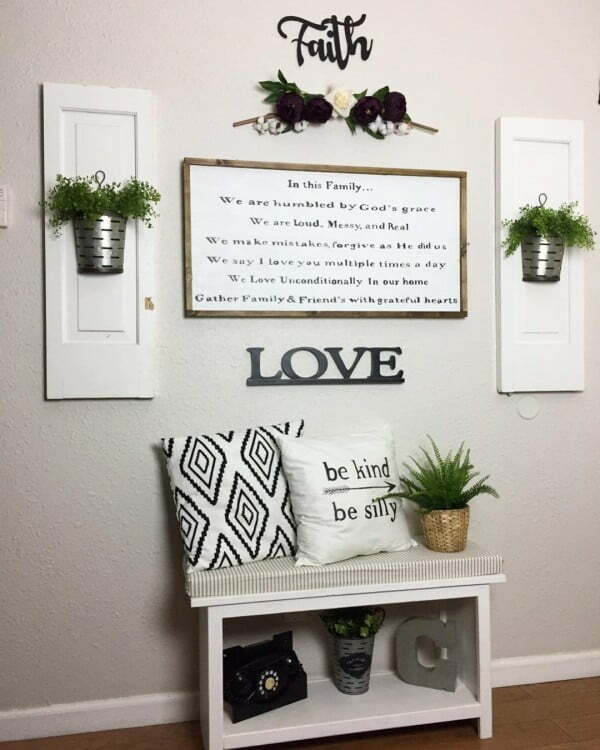 The signs on this gallery wall evoke happiness and echo the sentiments of home and family. The colors coordinate perfectly to bring a welcoming warmth to space. 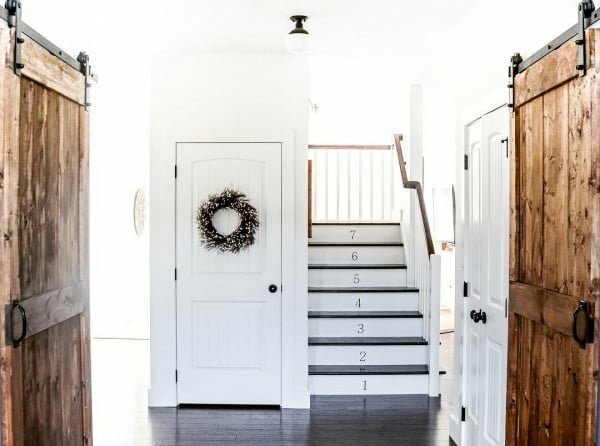 With its stunning shiplap wall, this modernized farmhouse design is perfect for the entryway. This display photos and multiple hooks bring function and beauty to space. 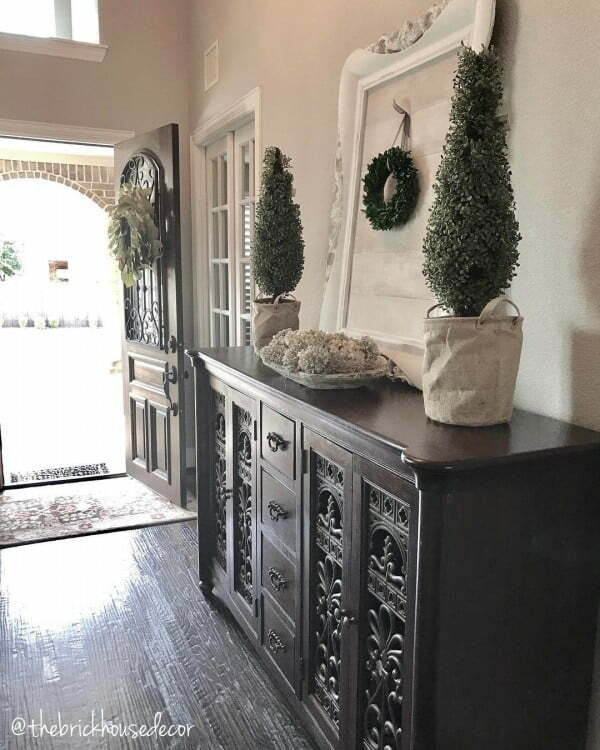 This custom entryway table brings a rustic vibe to this entryway. 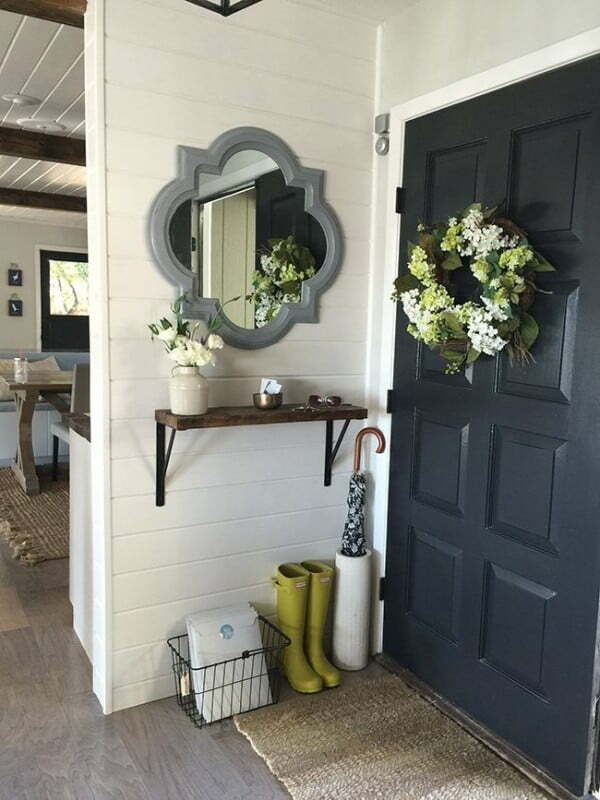 Its perfectly-placed accessories add height and interest, and the Rustoleum paint adds more to the rustic vibe. 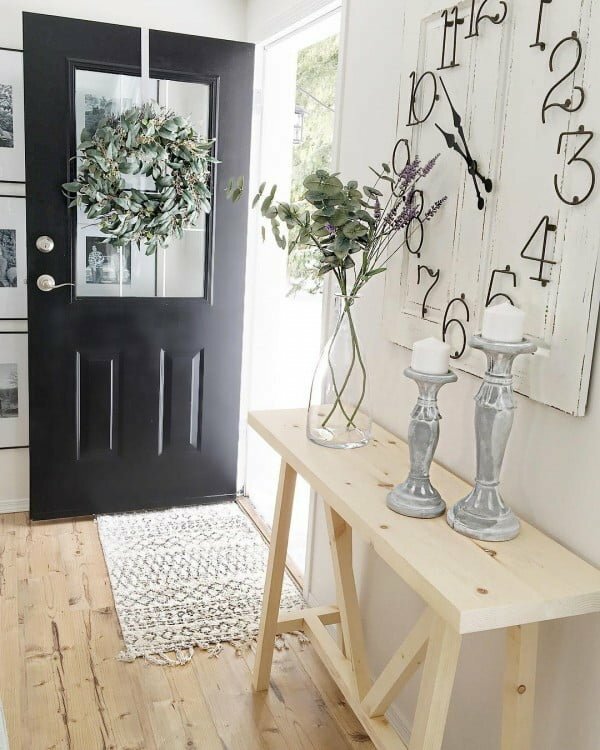 The chalkboard frame with its accompanying wreath makes a fabulous focal point for this creatively-designed entryway. The other accessories coordinate well with the richness of the railing. This light and airy entryway are simultaneously simplistic and sophisticated. The accessories used add understated elegance that leaves the space warm, clutter free and very inviting. This beautiful entryway has two spotlights on its focal wall that highlight the fascinating featured accessories. The hooks are beautiful and functional, and the bench is adorably accessorized. Having some extra storage elegantly is always a win-win. A simple rustic suspended shelf adds a lot of charm to your decor, and it’s convenient.